Lynn Jennings is an Olympic medalist and a nine-time champion of the USA Cross Country Championships. 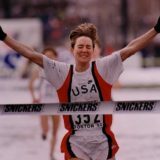 One of the greatest female American runners, she is a passionate athlete who now enjoys recreational running and rowing. In January 2014, her life changed when she experienced a pulmonary embolism. Today, she shares her experience with PE and how running saved her life. How did your experience with thrombosis begin? When did you first experience symptoms? My first symptoms showed when I went for a hilly trail run, four days before the incident. I was uncharacteristically out of breath within minutes of starting the run, which flummoxed me. I figured I was perhaps anemic and persevered through the run, stopping to walk now and then (a definite first). I told myself I’d go for blood work on Monday, which I did. Over the weekend, I felt bad. I had to hang onto the wall going upstairs in my house because my breathing was so labored. Pre-dawn Tuesday morning is when I had to sit down on a sidewalk, unable to walk further. Lynn was unable to finish her run and struggled to make her way home. Once there, a neighbor drove her to the hospital. When you were in the hospital, what type of treatments did you go through? I landed in the emergency room where many labs were taken to try and figure out what was wrong. I had a body scan, a lung scan, and a heart scan. I was hooked up to oxygen and stabilized and I was given an anticoagulant treatment. The head physician in the emergency room came and told me that she was very sure the cause was a pulmonary embolism. She was waiting for more tests to rule out other concerns, as well as to try and figure out the cause. Did you know anything about PE before you experienced it? If you had known more about PE, would it have changed how you reacted to it? I knew what “pulmonary” meant, but I had no idea what an embolism was. The doctor in the ER swung over my lung pictures to show me and to explain. I was shocked into silence. I had had extreme trouble breathing but no symptoms in my legs, indeed my ankles and calves were as bony and slim as ever and nothing hurt. So even if I had known more about what a PE was, I’m not sure I’d have added it all up. When I was unable to breathe on the sidewalk and when I was struggling home, I was soaking wet with sweat and my hands and feet were icy. I never added up why all that was happening or what could have been causing it. I was desperate to get home and not thinking of anything else except getting there. If you could go back to before your experience with PE, is there anything you would want to tell yourself? I never pieced together what was happening to me as it was happening. I lived alone, so there was nobody right there to look at me and say, “You need help.” I didn’t figure anything was really wrong (other than maybe I was anemic) because when things really started going south, there wasn’t anybody right there to give me the perspective of, “Hey, this isn’t right.” Call it athletic or life-long bodily hubris…. except I’m not sure I can call it that because the only reason I was successful as a world-class athlete was by sticking to what was real and what was happening with racing or training, not going off into the ether somehow. With the PE symptoms (until I had to sit down on the sidewalk) it never occurred to me that what was happening was hospital worthy. Can you tell me about how running, and the strength you have physically and mentally from it, affected your experience? Being a life-long runner with so many years of elite training and performing meant I had, and have, an intimate understanding and perception of how my body feels and acts when under performance stress in times of training and racing. I had no other language for what was happening to me prior to landing in the hospital, so I grabbed the lowest-hanging fruit I could think of: anemia. Somehow in my (potentially) hypoxic state, I forgot that anemia makes you tired not gasping for breath. I’ve always had utmost confidence in my strong body and brain and that confidence has served me well. The pulmonary embolism shook my bodily confidence hugely. I was terrified by what happened to me. I remember being in the hospital that week and being afraid of leaving the safety of my room and the incredible care of the doctors, nurses and specialists. I was afraid I’d drop dead on the sidewalk. That was the first time I’d ever experienced that feeling of complete bodily vulnerability. What was your recovery process like for you? Does your experience with PE still affect you? My recovery was probably textbook, but it didn’t feel that way to me. My body felt completely weak, exhausted, and assaulted when I was finally released to go home. I was determined to get back outside to walk my dog, Towhee, and to run again, but all of that took much longer than I would have ever anticipated. It was a triumph to retrace Towhee’s and my steps a week after I got out of the hospital. I was given specific instructions about not running for a while but tried anyway and realized, once again, the experts knew what they were talking about. So, I worked to build my strength by walking with Towhee as much as I could. It was slow going, but I did it. I didn’t go into the forest for quite a while, because I was still haunted by the idea that I might drop dead and didn’t want to be alone on a trail far from help. My confidence came back as my strength rebuilt. Are you still on any type of treatment? I was on Lovenox for a while and then on warfarin. Dealing with the dosing of the warfarin was a real trial with daily visits to the lab. That was a real adjustment! I successfully got off the warfarin exactly one year after going on it. I did not start running regularly again until August, almost seven months later. In the interim, I biked, hiked and walked and did a little bit of sculling in my single. Mostly I allowed myself to heal fully. Even that summer, I was getting out of breath just walking up slight inclines. I began running again and started with one mile. I built back up and was running free, healthy and with true vigor 1.5 years after the PE. I didn’t really feel like my full self, especially on up-hills, until the year and a half mark. In August of 2016, I was in the Alps for a month of high altitude hiking and I trained hard for it all summer to prepare. I knew upon completion of the training, and then the trip, that I was back to full strength. I am back to all my usual exploits: nordic skating and classic skiing, running, road cycling, hiking, sculling. My heart and lungs are 100%. I’ve never felt more thankful and appreciative or lucky. I am not on any kind of treatment and I’ve made a full recovery. In the end, the diagnosis was an unprovoked PE. Before the PE, I did not have a primary care physician (PCP) and had not had a physical or anything of that sort in years. I figured if it took that whole huge team at the hospital to get me well again so I could be out in the world, then I should do my part for self-care. I dutifully go to a PCP and got all the backlog of physical work done so that I was doing my part to honor the work that went into making me whole again by so many caring medical professionals. I am beyond grateful to the professionals at Legacy Good Samaritan Medical Center in northwest Portland, OR and in particular to my attending physician, Dr. Marilyn Replogle, as well as the over-the-top superb nursing staff who took incredible care of me. I was an extremely coachable athlete and I took that same approach with everyone who was caring for me. If they told me to do something, I did it. Dr. Replogle told me she was unsure why I was still here, that it was keeping her up at night and she wanted to figure out why this had happened to me. Her honesty and professional care gave me the confidence to face what had occurred and to commit to getting healthy. I am indebted to her. Do you have any messages for others dealing with PE? My message: rely on the experts around you, get informed about what has happened, and learn everything you can. Most of all: listen completely to your body as you recover. There is no timetable except the one your body sets. It took me a long time to trust my body again, and I got there by listening and absorbing fully how I felt. I guess I just mimicked completely what got me to the top as a world-class runner: I listened to my body and to the experts who guided me. Last: keep moving. Run, walk, bike, swim, hike, do yoga…… do. not. sit! Interested in learning more about Lynn? She will be sharing her personal journey at the upcoming NATF Celebration of Gratitude. Tickets and details are available online at www.natfonline.org. Email Events@natfonline.org to learn more.